Happy Thursday Team Strykerites (Strykerans? I haven’t decided on a nick name for you guys yet) I hope everyone is enjoying the crazy, stressful, fun that comes right before Christmas. I have 95% of my shopping done but still have some wrapping to do on top of that. I tried to be very good this year and did a ton of early shopping/online ordering but it seems like no matter how much I prepare for the holidays it will always come down to a mad scramble to get everything done in time. Hopefully you are all more prepared than me. 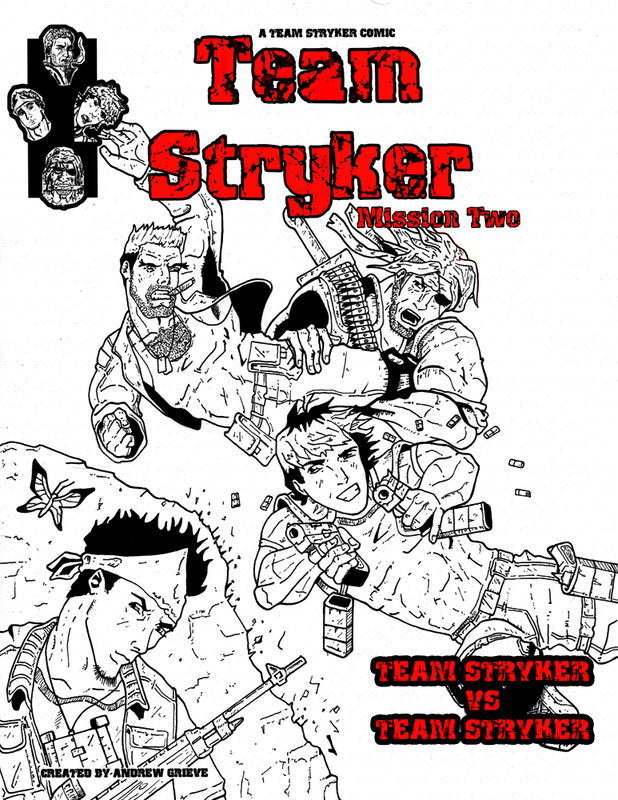 Today’s page is a retro look back on the cover to Team Stryker Mission 002. This was drawn and inked back in the fall of 2008. I had just finished Mission 001 for Matt’s (aka Eagleheart’s) wedding and had so much fun doing it that I instantly jumped into my second issue. Since I wasn’t on a deadline and was doing this mostly for my own entertainment I wanted it to be much closer to a real comic you would find on the shelves of your local store. Mission 002 ended up running 25 pages plus a cover and I was very excited to put it all together. I liked the idea of Team Stryker being turned against each other as since they are all so drastically different in their fighting styles I thought it would be fun to see how they would approach each other. It’s hard to fit all 4 characters (and Jeffery) onto a page together so covers have to be very well planned. The cover was the last page I drew for Mission 002 as I want to be at the top of my game when I do the cover since it will end up being the first thing any one sees of the issue. Have a great last weekend before Christmas. As an early Christmas gift to all you wonderful people out there I will have a special post on Monday for you to enjoy on your Christmas Eve. I just noticed that the logo you have in the upper left hand corner is freaking awesome.